18 | February | 2011 | SHANNARO!!! Decent chapter this week, it looks like we’ll be fully committed to the battle on Darui’s front for a while. Darui’s getting quite a bit of spotlight now but when his character was first introduced he didn’t seem very exceptional. The Raikage placing someone as young as him as a division general was definitely a surprise but the way he’s handling the Gin/Kin brothers this chapter makes it clear this guy is tougher and smarter than he appears. Darui has a lot of similarities to Kakashi: he is calm and collected even in the worst of situations, has a repertoire of powerful ninjutsus and the intelligence to analyze and strategize on the spot. Even after losing two of his close friends to the brothers’ gourd, Darui was able to maintain his composure and figure out the secret behind the brothers’ unique technique – a very important characteristic for a leader. I was a little confused initially about why Darui triggered the gourd even though he didn’t say “dull.” After reading it again, I think the reason was because he spoke the consecutive consonants for “du-ll” during his little speech and that was enough to activate the gourd. I can see why it was rather difficult for the translators to convey this word-play from Japanese to English. Darui was really lucky to have avoided being sucked into the gourd when his most spoken word changed just at the last moment and turn the tables on Kinkaku. As overpowered as the brothers are, I guess they’re not too bright. Makes me wonder how they got their hands on the Sage’s treasured artifacts. What happens to those sucked into the gourd is still unknown at this point, but I kind of see it much like Madara’s ability to warp others into another dimension – meaning Samui and her brother are probably still alive and so is Ginkaku. With Kinkaku possessing the golden ropes needed to free a person’s soul, it’s very unlikely that the same trick Darui used on Ginkaku will work on his brother. And with Ginkaku going into a Jinchuuriki’s transformation mode, their battle has now moved on to a whole new level. I kind of thought something like this would happen ever since it was mentioned the brothers possessed the taint of the Kyuubi’s chakra. 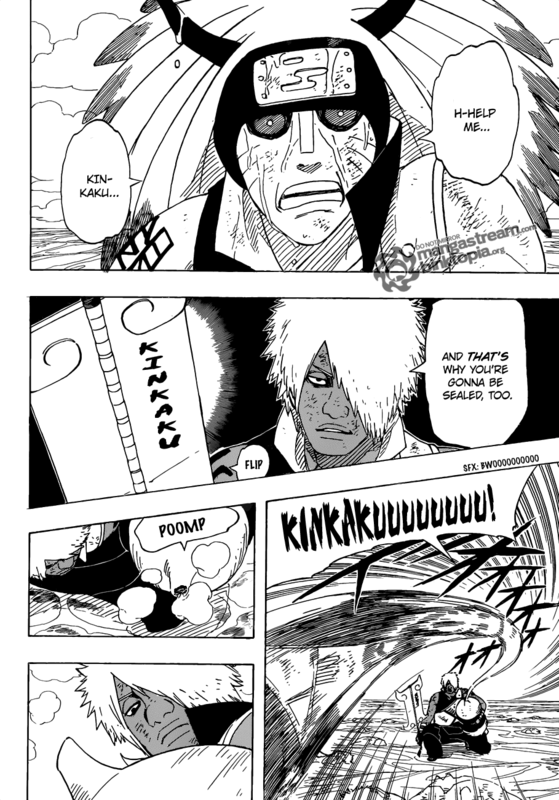 Even though Ginkaku stayed in Kyuubi’s stomach for two weeks, it’s still kind of hard to believe he could manage this level of transformation. 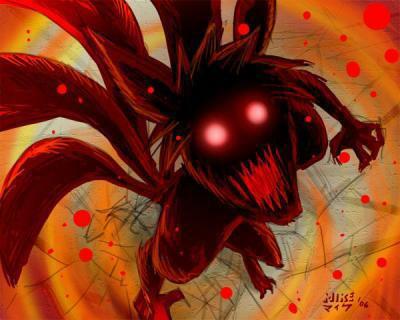 And notice that he has six tails instead of the four tails Naruto grows when he undergoes this Kyuubi transformation. 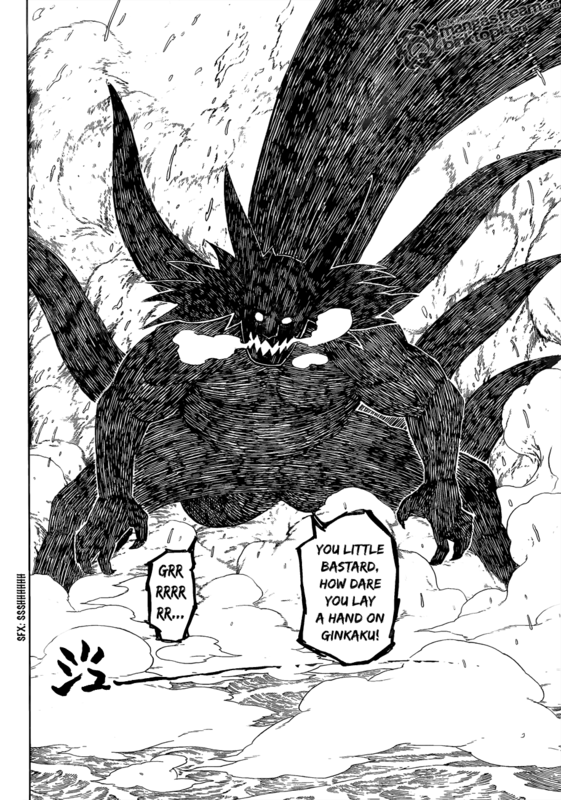 It’s hard to imagine that Ginkaku has enough dark chakra inside him to sustain this level of power, which is just three tails away from a full Kyuubi transformation. It brings back memories of that crappy Sora anime filler arc, lol. I hope Kishi gives us some epic battles in the next chapter, but with Darui’s chakra severely sapped by the weapons he’s holding, he’ll need some major backup to take on Ginkaku. Cool to see Kakuzu in his fighting form again, and with all four masks intact no less. His mention of seeing Ginkaku before in his transformed state means they have encounter each other before – but were they allies or enemies in the past? It’s Out! 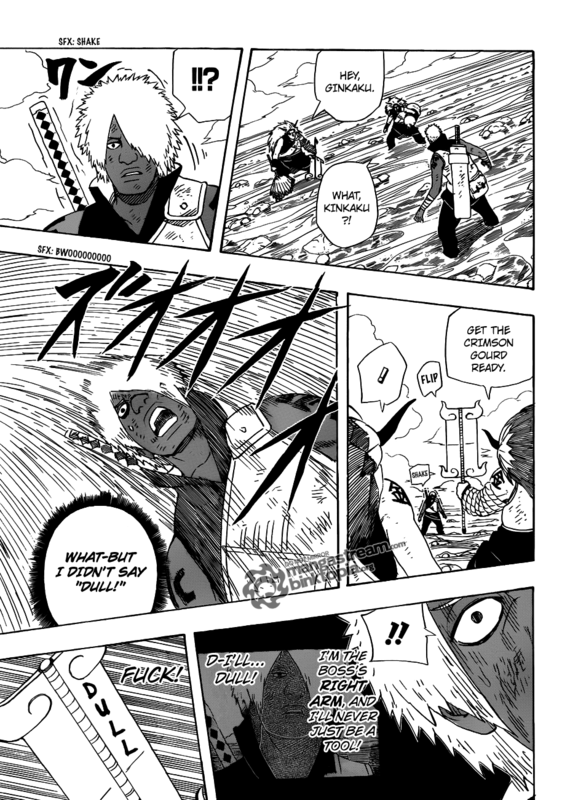 Naruto Chapter 528!